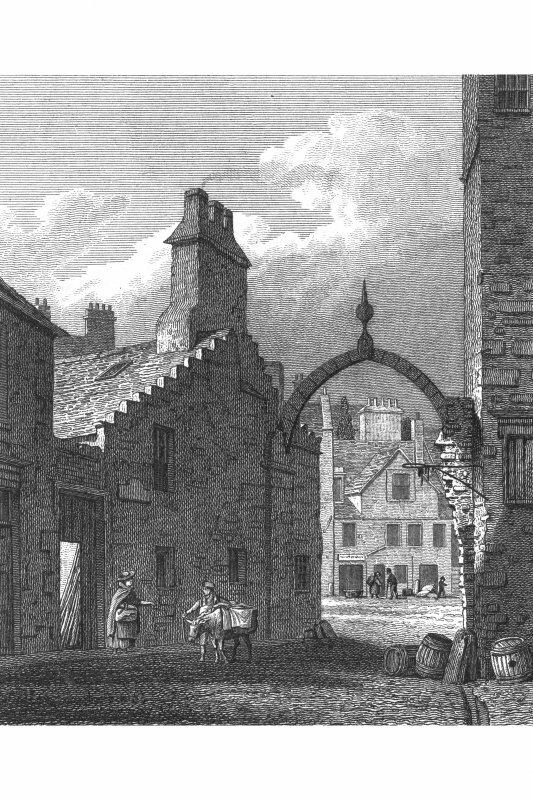 Lying adjacent to the White Horse Close, Water Yett was the principal approach to Canongate from the east coast. Indicated on the town plan of 1544, the Water Yett received notice in 1568 when 'the port and yett pass and into the Abbaye Kirk' were to be refurbished in timber and iron work. When the port or yett was removed is not exactly known although a single arch of wood marked the site until it was blown down in a gale in 1822. It must have served a purely administrative function, perhaps in connection with the collection of tolls. Maitland Club Extracts 1840; J Grant 1882; D Wilson; A T Simpson, S Stevenson and N Holmes 1981.